Even though I’m no longer an employee of Nevada Humanities, I’m still making some radio pieces for them which air on KUNR, Reno’s Public Radio station as part of the Nevada’s Hidden Stories series. 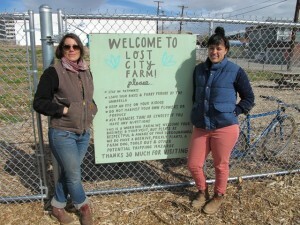 The most recent piece to air in the series was about Lost City Farm, which is Reno’s first modern urban farm. It’s situated on the corner of Center Street and Moran in the midtown area of the city and its the creation of two young entrepreneurs – Toni Ortega and Lyndsey Langsdale. In this story, they talk about what motivated them to start the project, the many challenges they faced, the support they’ve received, and why Reno is the perfect setting for an urban farm.